Whitewater-rafting guides who have been plying the Gauley River in West Virginia are reporting that water temperatures are higher than normal for autumn. Officials at one of the state’s adventure resorts say there’s a good explanation. “Though they’re not out there with thermometers, the guides have noticed,” says Dave Arnold, a co-founder of Adventures on the Gorge and a pioneer rafter on the New and Gauley rivers in southern West Virginia. Waterflow on the Gauley increases tremendously in autumn as impounded water is drawn off upstream on Summersville Lake, Arnold explained. The draw-down provides room for spring snowmelt off the Allegheny Mountains but also provides turns the river below into a paddler’s dream-come-true. 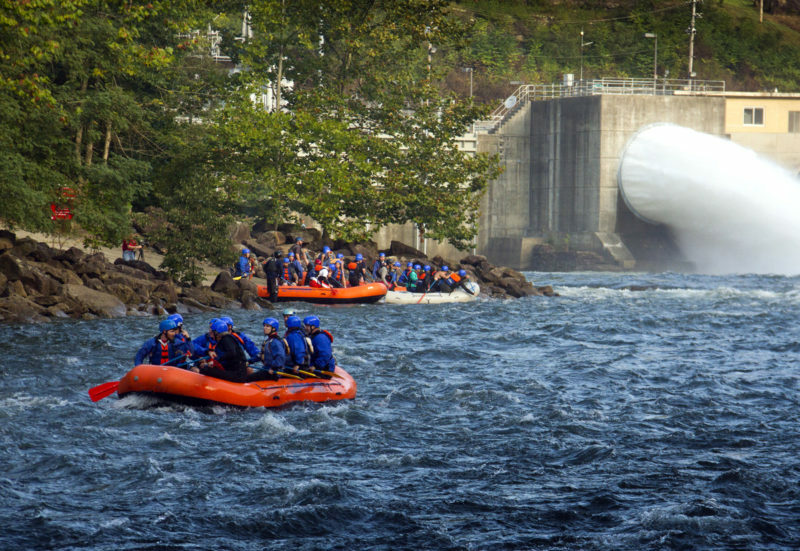 From early September through mid-October—during “Gauley Season,” as the draw-down is known—thousands of rafters and kayakers from across the globe challenge the 25-mile run, which features almost 100 rapids, including nine Class-V rapids. Arnold says that because the summer had been relatively dry, the lake received below-average in-flow since the beginning of July, allowing the sun to warm. Even as air temperature drops in the fall, water temperatures below the dam are slow to follow because when the floodgates are opened, the cold water from the bottom of the lake is sent down the river. As the lake is drained over several weeks, it becomes more shallow and the overall temperatures increase. Dave Hartvigsen, CEO for the company, says that in a large body of water a distinct layer called a thermocline separates the turbulent surface from the calm water below. The surface water possesses more oxygen and is therefore subject to heating and cooling coming from the sun and air. Deeper water, on the other hand, is denser and less likely to experience significant changes in temperature. “Generally, as water cools, it increases in density and sinks through warmer layers until it stabilizes,” Hartvigsen says. Even as air temperature drops in autumn, water temperatures below the lake are slow to follow because cold water from the bottom of the lake is sent down the river. As the lake is drained over several weeks, it becomes more shallow and overall temperatures increase. Arnold says rafters can expect the warm waters to linger through October. Eventually, the lake will cool down as winter arrives, but the rafting season and drawdown of the lake will be complete long before then. Travelers can find out more about Adventures on the Gorge and arrange Gauley Season rating trips online or by calling 1-855-379-8738.